Despite growing up a mere 3-hour drive away, I had never been to Mexico. My parents told me that it was too dangerous to go anywhere other than an all-inclusive resort due to drug violence and because they had a friend who ran into trouble in Mexico back in the 80’s. On Monday, I had an interview for Global Entry (a program run by Customs and Border Patrol that gives me TSA precheck). Since I could not get an interview in the LA office until November, I decided to sign up for an interview spot at San Ysidro on the border with Mexico. 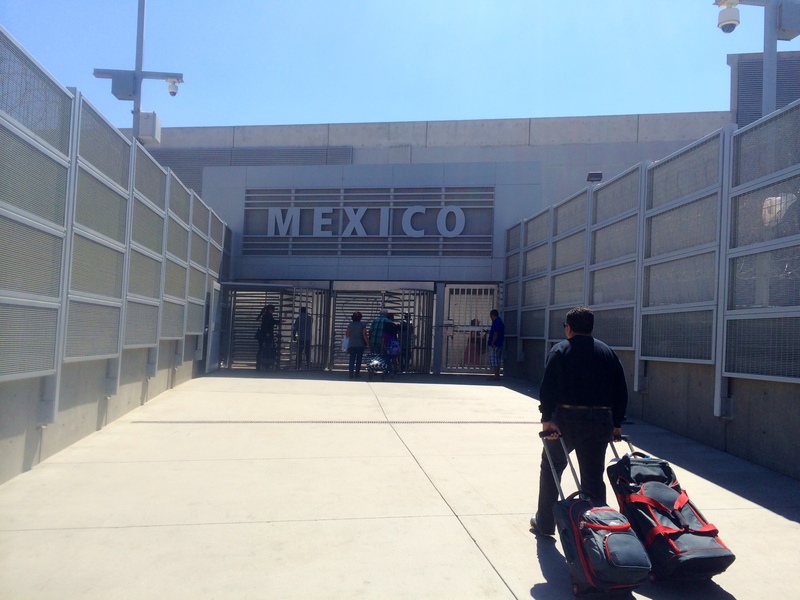 I drove down to San Ysidro on Monday morning and parked my car in one of the lots where people walk over the border. It turns out that the interview building was a mere 30-second walk from the border crossing. 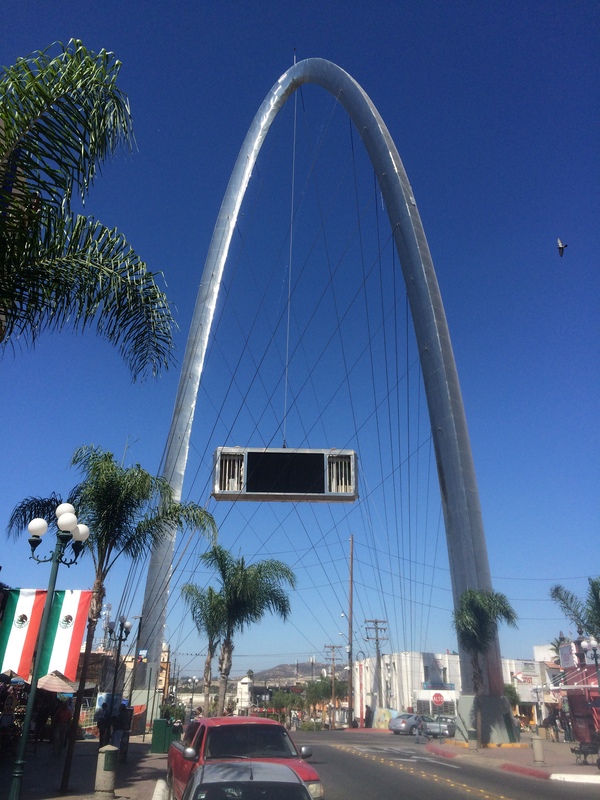 Since I already had my passport (which was required for the interview) and had paid for parking, I decided to take the plunge and cross into Tijuana on my own. For safety precautions, I left my wallet locked in my car, took only $40 of cash and stuffed a credit card in my sock. I crossed the border through a large revolving gate. The other side was drastically different. There was graffiti everywhere and a soldier holding a large gun. While most people probably would be frightened, I was actually relieved because it reminded me of my travels this summer. The interesting part of this crossing is that Mexico didn’t have any border security, so once I passed the USA gate, I was in Mexico. No passport stamps, no nothing. I walked over to the taxi stand and caught a cab to Avenida Revolution, the main tourist drag in town. The ride cost 50 pesos or about $4. When in the cab, I told the driver that I was in San Diego for work and wanted to get lunch here because the border line was short. I ended up creating an elaborate story to make the driver feel that this was not my first time here because I was nervous that I could be kidnapped if he knew I came here alone. The driver actually spoke perfect English and we had a nice conversation before he dropped me off in front of the Caesar Hotel. The Caesar Hotel is where the Caesar salad was invented, so I decided to get lunch there. I ordered the salad and a fettucini alfredo and the whole meal cost me $20 or about 250 pesos. I drank the tap water. While the menu was mostly in English, I decided to practice my Spanish with the waiter. The food was excellent and the salad was actually prepared at the table. I would definitely go back to Caesars, although it was kind of funny that I only ate Italian food while in Mexico. After lunch, I walked down the Avenida Revolution, which looked a lot like East Los Angeles. Since it was midday on a weekday, it was not very crowded. About 10% of all the people were white tourists and another 10% of the people were armed police officers. The street was lined with souvenir shops selling tacky Mexican ponchos and sombreros. Most of the ponchos had US sports team logos and the sombreros had English writing. The Avenida also had at least 2-dozen bars advertising cheap margaritas and Mexican beers. At the end of the street, there was also a mini Gateway Arch about 65 feet tall. The one thing I really did not like were the donkeys painted to look like zebras. For about $5-10 you could take a picture with one. I refused since the animals were most certainly abused. That said, I felt completely safe walking around here on my own. While people hawked me to come into their shop or buy something, they were very responsive to my “no”. So in that sense, Tijuana was easier to walk around than most places on the Big Trip including India, Nepal and Zambia. After exploring the street and the nearby neighborhood, I walked back to the border along the lit walkway. It was lined with merchants and a few beggars. Following the blue “To USA” signs, it took me 30 minutes to reach the border. There, I got into the pedestrian line where I waited 45 minutes before going through customs.